Appreciate the understated glamour and traditional comfort in this collection of the most excellent examples of timeless Korean architecture. Hanok: The Korean House provides new insights on the stylish traditional Korean homes that are experiencing a resurgence of popularity in Seoul today. While the exteriors of these houses are indistinguishable from traditional hanok built decades ago, the insides have entirely changed and adapted with the times. Korea is a nation that has radically transformed itself in recent decades, yet amidst the glass-and-steel skyscrapers and luxury apartments, the Korean design of the hanok still survives and plays a surprisingly important role. This book showcases 12 very special hanok that have been selected to reflect the Korea of today. The original hanok design has not changed. Traditional craftsman-made materials of stone, wood, and clay are still the only components used in these houses. They also incorporate natural elements such as wind and sunlight, and baesanimsu (better known in its Chinese form as feng shui) is used to position the hanok in harmony with the natural forces and geographical features of the site. 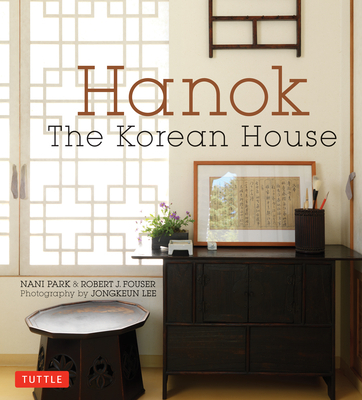 Each hanok has a unique story to tell, and this book studies the personality of each house from the point of view of its owners, many of whom are talented devotees of Korean architecture themselves. Each of the Korean homes in Hanok: The Korean House was thoughtfully researched and photographed with the intention of giving the reader a feel for a culture reconciling its modern tendencies with its traditional roots. Nani Park was born in Korea, but grew up in Hawaii, which gives her the special perspective as an insider and outsider in Korea. Currently residing in Seoul, she started this project when she realized there was a lack of well-made books on Hanok in the market. Nani grew up in a hanok when she was young and wanted to share her experience of what the hanok lifestyle is in this modern age. As an award winning illustrator and art educator, Nani has been in the art industry for over two decades. With master of fine arts from the School of Visual Arts in New York, she continues to express her art in different media, as seen in this book. Robert J. Fouser was born and raised in Ann Arbor, Michigan. He holds a B.A. in Japanese language and literature, an M.A. in applied linguistics, both from the University of Michigan, and a Ph.D. in applied linguistics from Trinity College Dublin. Since 2008, he has been teaching Korean as a second/foreign language education at Seoul National University. He writes frequently on Korean society and culture and has been active in promoting hanok preservation. Lee Jongkeun has become one of Korea's foremost photographers of interiors, food, and products since establishing Apo Associates (www.apo.co.kr) in 1995. He works actively in the field of advertising and contributes regularly to design and lifestyle magazines. He is also the photographer for Korea Style, published by Tuttle Publishing.